Every year Thailand marks the celebration of King Bhumibol Adulyadej’s birthday at the beginning of December. 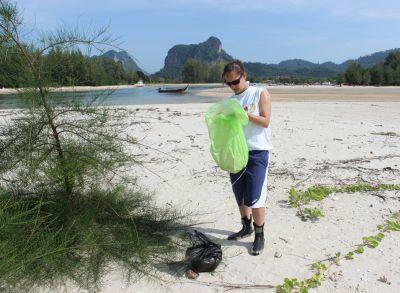 This year, the Conservation Project run by Projects Abroad in Krabi, was invited by the local government to celebrate the occasion by cleaning up the coral reefs of Koh Hong as part of the “Dive against Debris” initiative. Projects Abroad Thailand has been working closely with staff from the local government in the Krabi region for over two years, maintaining the health of marine ecosystems through a variety of initiatives. These include regular beach and reef clean-ups, such as the one that was held in honor of the king. Such clean-ups are vital to the surrounding islands, including popular tourist destination Ko Phi Phi, where over 6000kg of harmful debris has been collected. Future initiatives include the building of ‘fish houses’, which involves growing reefs in cement tubes. 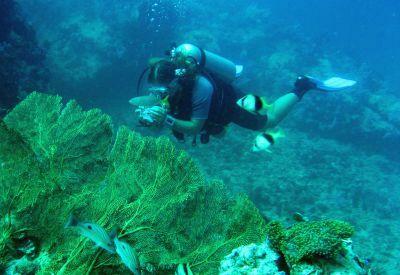 Projects Abroad staff and volunteers will be helping to monitor the growth of these reefs and the fish populations that will be occupying these new areas. Projects Abroad Thailand’s Conservation Project Manager, Pamela Benjasirichai, hopes that this partnership will extend beyond the reefs of Thailand, “As well as hoping this partnership of joined conservation work will improve Krabi’s marine ecosystems, we also hope to create awareness of the local environment amongst the local Thai community, children, and tourists’, she says. The work that Projects Abroad volunteers are doing in Thailand is playing an important role in terms of marine research and conservation. Volunteers on this placement have the opportunity to immerse themselves in one of the world’s most beautiful destinations while also conserving the delicate eco-systems, which face on-going depletion if not actively protected. Thank you to all the volunteers and staff members who have worked tirelessly, combing the beach’s shores for any waste to dispose of. It is in part thanks to these individuals that local people and animals have a cleaner and safer environment to inhabit. Read more about the Conservation Project in Thailand.